Awake Fibreoptic Intubation (AFOI) is, nowadays, the gold standard in predicted difficult airway management. Numerous practice guidelines have been developed to assist clinicians facing with a difficult airway. If conducted without sedation, it is common that this procedure may lead to high patient discomfort and severe hemodynamic responses. Sedation is frequently used to make the process more tolerable to patients even if it is not always easy to strike a balance between patient comfort, safety, co-operation, and good intubating conditions. In the last years, many drugs and drug combinations have been described. This minireview aims to discuss the evidence supporting the use of Dexmedetomidine (DEX) in the AFOI management. Keywords: Dexmedetomidine, Fiberoptic intubation, Airway management, Hemodynamic responses, Sedation, Gold standard. © 2019 Alfieri et al. The estimated incidence of patients with difficult airway during clinical anesthesia is 1-18%; in these patients with a difficult airway, the anatomy is frequently different from normal, and the inadequate airways management may result in hypoxemia, hypoventilation, aspiration, brain damage or even death [1Shiga T, Wajima Z, Inoue T, Sakamoto A. Predicting difficult intubation in apparently normal patients: A meta-analysis of bedside screening test performance. Anesthesiology 2005; 103(2): 429-37. [http://dx.doi.org/10.1097/00000542-200508000-00027] [PMID: 16052126] ]. Up to 30% of all deaths attributable to anesthesia are related to difficult airway management [2Schmitt H, Buchfelder M, Radespiel-Tröger M, Fahlbusch R. Difficult intubation in acromegalic patients: Incidence and predictability. Anesthesiology 2000; 93(1): 110-4. [http://dx.doi.org/10.1097/00000542-200007000-00020] [PMID: 10861153] ]. Awake Fiberoptic Intubation (AFOI) is considered the Gold Standard in patients with a predicted difficult airway [3Rosenstock CV, Thøgersen B, Afshari A, Christensen AL, Eriksen C, Gätke MR. Awake fiberoptic or awake video laryngoscopic tracheal intubation in patients with anticipated difficult airway management: a randomized clinical trial. Anesthesiology 2012; 116(6): 1210-6. [http://dx.doi.org/10.1097/ALN.0b013e318254d085] [PMID: 22487805] ]. This methodology could be conducted in totally awake patients after airway local anesthesia, under conscious sedation or by combining both approaches to limit airways reactivity. During AFOI, coughing and laryngospasm in reaction to intubation can be problematic, so an effective airway local anesthesia is mandatory for the comfort of the patient and subsequent success of the procedure. Proper local anesthesia also seems to reduce sedation doses of midazolam and fentanyl [4Xue FS, Liu HP, He N, et al. Spray-as-you-go airway topical anesthesia in patients with a difficult airway: A randomized, double-blind comparison of 2% and 4% lidocaine. Anesth Analg 2009; 108(2): 536-43. [http://dx.doi.org/10.1213/ane.0b013e31818f1665] [PMID: 19151284] , 5Johnston KD, Rai MR. Conscious sedation for awake fibreoptic intubation: A review of the literature. Can J Anaesth 2013; 60(6): 584-99. [http://dx.doi.org/10.1007/s12630-013-9915-9] [PMID: 23512191] ]. When AFOI is effectuated without sedation, it is commonly related to patient discomfort and severe hemodynamic responses, inducing catecholamine release by sympathetic stimulation, sympathetic stimulation, which may result in increased heart rate and blood pressure, arrhythmia, and cause myocardial ischemia and infarction in patients with risk factors, such as hypertension and ischemic heart disease [6Jarineshin H, Kashani S, Vatankhah M, Abdulahzade Baghaee A, Sattari S, Fekrat F. Better hemodynamic profile of laryngeal mask airway insertion compared to laryngoscopy and tracheal intubation. Iran Red Crescent Med J 2015; 17(8): e28615. [http://dx.doi.org/10.5812/ircmj.28615] [PMID: 26430529] , 7Cakırgöz MY, Taşdöğen A, Olguner C, et al. [The effect of different doses of esmolol on hemodynamic, bispectral index and movement response during orotracheal intubation: prospective, randomized, double-blind study]. Rev Bras Anestesiol 2014; 64(6): 425-32. [PMID: 25437700] ]. The sedation may alleviate the awake intubation, but it requires conscientious administration and continuous monitoring as it can lead to airway obstruction and hypoxemia, while inadequate sedation could lead to discomfort, anxiety and excessive sympathetic discharge. Different pharmacological approaches have been reported to obtain conscious sedation and prevent cardiovascular changes during AFOI such as local anesthetics, benzodiazepines, opioids, α2 adrenoceptor agonists and less commonly propofol or ketamine [5Johnston KD, Rai MR. Conscious sedation for awake fibreoptic intubation: A review of the literature. Can J Anaesth 2013; 60(6): 584-99. [http://dx.doi.org/10.1007/s12630-013-9915-9] [PMID: 23512191] , 8Cook TM, Woodall N, Frerk C. The NAP4 Report: Major Complications of Airway Management in the United Kingdom 2011. Last accessed on 2016 http:// www.rcoa.ac.uk/system/files/CSQ-NAP4-14He X, Shi X, He Q. Dexmedetomidine for the management of fibreoptic intubation. Cochrane Libr 2012.]. In order to achieve the ideal conditions for AFOI, the patient should be comfortable, compliant, does not present excessive oropharyngeal secretion or blood, and with the ability to maintain spontaneous ventilation to tolerate the passage of a fiberscope in order to facilitate fiber-optic intubation [15Dang BW, Zhang J. Safety and efficacy of argon plasma coagulation for resection of lipomas and hamartomas in large airways. Asian Pac J Cancer Prev 2011; 12(2): 477-80. [PMID: 21545216] ]. It is remarkable for patients undergoing sedated but awake AFOI to have decreased anxiety, discomfort, and hemodynamic disturbances. The ideal drug to obtain these conditions should, therefore, be short-acting and easily titratable to obtain an adequate sedation level, with minimal effects on spontaneous ventilation [16Cattano DLN, Ferrario L, Seitan C, Vahdat K, Wilcox DW, Hagberg CA. Dexmedetomidine versus remifentanil for sedation during awake fiberoptic intubation. Anesthesiol Res Pract 2012; 2012 Available at: http://www.hindawi .com/journals/arp/2012/753107/[http://dx.doi.org/10.1155/2012/753107] , 17Leslie D, Stacey M. Awake intubation. Continuing education in anaesthesia. Critical Care & Pain 2015; 15: 64-7.]. Anyhow, it is commonly arduous to provide these conditions using a single medication or approach. In Table 1, a synthesis of the effects or the more commonly used drugs to manage AFOI is presented. Commonly, opioids combined with benzodiazepines are utilized for sedation in AFOI. It has been described that sufentanil, alfentanil, fentanyl, and other opioids minimize the alteration elicited by fiberoptic intubation [18Figueredo E, Garcia-Fuentes EM. Assessment of the efficacy of esmolol on the haemodynamic changes induced by laryngoscopy and tracheal intubation: A meta-analysis. Acta Anaesthesiol Scand 2001; 45(8): 1011-22. [http://dx.doi.org/10.1034/j.1399-6576.2001.450815.x] [PMID: 11576054] -21Costi D, Cyna AM, Ahmed S, et al. Effects of sevoflurane versus other general anaesthesia on emergence agitation in children. Cochrane Database 2014; CD007084. [http://dx.doi.org/10.1002/14651858.CD007084.pub2] ]. However, opioids have the risk to induce respiratory depression. Sufentanil has been compared with fentanyl, and it has shown to obtain deeper and longer analgesia, presently shorter episodes of respiratory depression, but if used alone for AFOI, it can induce a greater incidence of recall [22Shen SL, Xie YH, Wang WY, Hu SF, Zhang YL. Comparison of dexmedetomidine and sufentanil for conscious sedation in patients undergoing awake fibreoptic nasotracheal intubation: a prospective, randomised and controlled clinical trial. Clin Respir J 2014; 8(1): 100-7. [http://dx.doi.org/10.1111/crj.12045] [PMID: 23906186] , 23Bailey PL, Streisand JB, East KA, et al. Differences in magnitude and duration of opioid-induced respiratory depression and analgesia with fentanyl and sufentanil. Anesth Analg 1990; 70(1): 8-15. [http://dx.doi.org/10.1213/00000539-199001000-00003] [PMID: 2136976] ]. In a recent study, Tsukamoto et al. describe the cases of sedated AFOI using small doses of midazolam and fentanyl in combination with effective local lidocaine airway anesthesia, reporting good results on the success of the procedure with minimal hemodynamic changes and with minimal discomfort for the patient [24Tsukamoto M, Hitosugi T, Yokoyama T. Awake fiberoptic nasotracheal intubation for patients with difficult airway. J Dent Anesth Pain Med 2018; 18(5): 301-4. [http://dx.doi.org/10.17245/jdapm.2018.18.5.301] [PMID: 30402550] ]. Remifentanil is now under several investigations stimulating great interest especially because it has both analgesic and antitussive properties during awake intubation while allowing communication with the patient to be maintained. The use of remifentanil has been described to be helpful for awake intubation with or without the combination of local airways anesthesia [25Puchner W, Egger P, Pühringer F, Löckinger A, Obwegeser J, Gombotz H. Evaluation of remifentanil as single drug for awake fiberoptic intubation. Acta Anaesthesiol Scand 2002; 46(4): 350-4. [http://dx.doi.org/10.1034/j.1399-6576.2002.460403.x] [PMID: 11952431] -28Mingo OH, Ashpole KJ, Irving CJ, Rucklidge MWM. Remifentanil sedation for awake fibreoptic intubation with limited application of local anaesthetic in patients for elective head and neck surgery. Anaesthesia 2008; 63(10): 1065-9. [http://dx.doi.org/10.1111/j.1365-2044.2008.05567.x] [PMID: 18673364] ]. Some studies have investigated the optimal dose of remifentanil required for sedation by TCI during AFOI. Rai and collaborators suggested that a target concentration of remifentanil of 3.2 (2.8-3.5) ng/ml provided adequate sedation for AFOI. This study shows a median endoscopy score different than that of similar studies with a similar concentration of remifentanil, probably for premedication with midazolam and for reaching the deeper local airways anesthesia [11Vennila R, Hall A, Ali M, Bhuiyan N, Pirotta D, Raw DA. Remifentanil as single agent to facilitate awake fibreoptic intubation in the absence of premedication. Anaesthesia 2011; 66(5): 368-72. [http://dx.doi.org/10.1111/j.1365-2044.2011.06687.x] [PMID: 21443641] -13Rai MR, Parry TM, Dombrovskis A, Warner OJ. Remifentanil target-controlled infusion vs propofol target-controlled infusion for conscious sedation for awake fibreoptic intubation: a double-blinded randomized controlled trial. Br J Anaesth 2008; 100(1): 125-30. [http://dx.doi.org/10.1093/bja/aem279] [PMID: 18037667] ]. In this study the authors described how, in remifentanil groups without midazolam premedication, there has been greater recall of intubation, this may indicate that remifentanil has less of an amnesic effect than DEX at the same level of sedation. According to the author DEX and remifentanil were both effective in patients undergoing AFOI but DEX offers better endoscopy scores, lower recall of intubation, and greater patient satisfaction, with minor hemodynamic side effects. Moreover, these results should also be complemented by the evidence reported by Vennila and colleagues asserting that intubation was achieved with a higher remifentanil concentration without the use of local anesthesia and benzodiazepine [11Vennila R, Hall A, Ali M, Bhuiyan N, Pirotta D, Raw DA. Remifentanil as single agent to facilitate awake fibreoptic intubation in the absence of premedication. Anaesthesia 2011; 66(5): 368-72. [http://dx.doi.org/10.1111/j.1365-2044.2011.06687.x] [PMID: 21443641] ]. Some singular characteristics of DEX make it a useful solution for sedation in AFOI [5Johnston KD, Rai MR. Conscious sedation for awake fibreoptic intubation: A review of the literature. Can J Anaesth 2013; 60(6): 584-99. [http://dx.doi.org/10.1007/s12630-013-9915-9] [PMID: 23512191] ]. In addition to hemodynamic stability, anxiolytic and analgesic properties can also determine a deep state of sedation while maintaining easy arousability without causing respiratory depression, even at higher doses. Moreover, it also decreases salivary secretions, allowing better visualization through the fiberscope and decreasing the risks of inhalation. 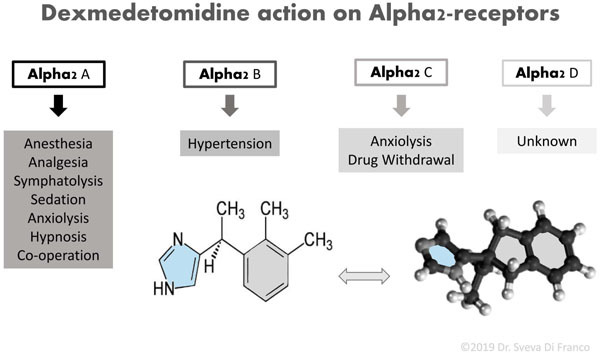 Dexmedetomidine is an alpha2-adrenergic agonist (C13 H16HCl), comparable for its structure to clonidine but with a greater affinity, 8 to 10 times more selective, for alpha2-receptors over alpha1-receptors [29Wagner DS, Brummett CM. Dexmedetomidine: as safe as safe can be. Semin Anesth, Perioper Med Pain 2006; 25: 77-83. [http://dx.doi.org/10.1053/j.sane.2006.02.003] ]. It is the dextrorotatory S-enatiomer of medetomidine chemically described as (+)-4-(2,3-dimethyle phenyl) ethyl-1H -imidazole monohydrochloride. Recently it has been introduced to anaesthesia practice. Fig. (1 ) reports a scheme of DEX chemical structure and summarizes the action of DEX on all subtypes of alpha2-adrenergic G-Protein-coupled receptors. The action on postsynaptic alpha2-adrenergic receptors in the locus coeruleus explains the sedative and anxiolytic effects of DEX, decreasing the sympathetic tone. Therefore, the DEX can influence the release of substance P in the dorsal horn of the spinal cord providing its analgesic effects [30Buck K, Voehringer P, Ferger B. The alpha(2) adrenoceptor antagonist idazoxan alleviates L-DOPA-induced dyskinesia by reduction of striatal dopamine levels: In vivo microdialysis study in 6-hydroxydopamine-lesioned rats. J Neurochem 2010; 112(2): 444-52. [http://dx.doi.org/10.1111/j.1471-4159.2009.06482.x] [PMID: 19895663] ]. It has to be noticed that these subtypes of receptors are found ubiquitously in the central, peripheral, and autonomic nervous systems, as well as in vital organs and blood vessels [31Afsani N. Clinical application of dexmedetomidine. S Afr J Anaesthesiol Analg 2010; 16: 50-6.]. Chrysostomou et al. described that the administration of DEX alone gives analgesia and sedation but shows benzodiazepine- and opioid-sparing effect when used with anesthetic drugs [32Chrysostomou C, Schmitt CG. Dexmedetomidine: sedation, analgesia and beyond. Expert Opin Drug Metab Toxicol 2008; 4(5): 619-27. [http://dx.doi.org/10.1517/17425255.4.5.619] [PMID: 18484919] ] DEX is of interest because it possesses sedative, anxiolytic, analgesic and sympatholytic properties during awake intubation, without affecting the respiratory function [33Haselman MA. Dexmedetomidine: a useful adjunct to consider in some high-risk situations. AANA J 2008; 76(5): 335-9. [PMID: 18947160] ]. Furthermore, DEX is characterized by a rapid distribution phase with a distribution half-life of six minutes and a terminal elimination half-life (t1/2) of two hours. It exhibits linear kinetics between 0.2 - 0.7 micrograms (mcg)/kg/hr on i.v. Infusion up to 24h [34Anttila M, Penttilä J, Helminen A, Vuorilehto L, Scheinin H. Bioavailability of dexmedetomidine after extravascular doses in healthy subjects. Br J Clin Pharmacol 2003; 56(6): 691-3. [http://dx.doi.org/10.1046/j.1365-2125.2003.01944.x] [PMID: 14616431] ]. AFOI management a synthesis of the effects of the most commonly used drugs. DEX chemical structure. The action of DEX on subtypes of alpha2-adrenergic G-Protein-coupled receptors. Some pieces of evidence seem to reveal that DEX reduces the sympathetic nervous system response, and inhibits harmful cardiovascular changes by reducing the noradrenaline release [35Bloor BC, Ward DS, Belleville JP, Maze M. Effects of intravenous dexmedetomidine in humans. II. Hemodynamic changes. Anesthesiology 1992; 77(6): 1134-42. [http://dx.doi.org/10.1097/00000542-199212000-00014] [PMID: 1361311] ]. Furthermore, it may induce, at high dosage, side effects including hypotension, bradycardia, atrial arrhythmia, and hypoxia [36Ebert TJ, Hall JE, Barney JA, Uhrich TD, Colinco MD. The effects of increasing plasma concentrations of dexmedetomidine in humans. Anesthesiology 2000; 93(2): 382-94. [http://dx.doi.org/10.1097/00000542-200008000-00016] [PMID: 10910487] ].The efficacy of DEX as a sedative agent in the AFOI has been described with encouraging results in several studies [16Cattano DLN, Ferrario L, Seitan C, Vahdat K, Wilcox DW, Hagberg CA. Dexmedetomidine versus remifentanil for sedation during awake fiberoptic intubation. 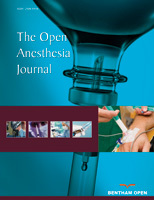 Anesthesiol Res Pract 2012; 2012 Available at: http://www.hindawi .com/journals/arp/2012/753107/[http://dx.doi.org/10.1155/2012/753107] , 22Shen SL, Xie YH, Wang WY, Hu SF, Zhang YL. Comparison of dexmedetomidine and sufentanil for conscious sedation in patients undergoing awake fibreoptic nasotracheal intubation: a prospective, randomised and controlled clinical trial. Clin Respir J 2014; 8(1): 100-7. [http://dx.doi.org/10.1111/crj.12045] [PMID: 23906186] , 37Tsai CJ, Chu KS, Chen TI, Lu DV, Wang HM, Lu IC. A comparison of the effectiveness of dexmedetomidine versus propofol target-controlled infusion for sedation during fibreoptic nasotracheal intubation. Anaesthesia 2010; 65(3): 254-9. [http://dx.doi.org/10.1111/j.1365-2044.2009.06226.x] [PMID: 20105150] -41Bergese SD, Candiotti KA, Bokesch PM, Zura A, Wisemandle W, Bekker AY. A Phase IIIb, randomized, double-blind, placebo-controlled, multicenter study evaluating the safety and efficacy of dexmedetomidine for sedation during awake fiberoptic intubation. Am J Ther 2010; 17(6): 586-95. [http://dx.doi.org/10.1097/MJT.0b013e3181d69072] [PMID: 20535016] ]. Moreover, some authors described how DEX exhibits better sedation than propofol, fentanyl and remifentanil during AFOI [37Tsai CJ, Chu KS, Chen TI, Lu DV, Wang HM, Lu IC. A comparison of the effectiveness of dexmedetomidine versus propofol target-controlled infusion for sedation during fibreoptic nasotracheal intubation. Anaesthesia 2010; 65(3): 254-9. [http://dx.doi.org/10.1111/j.1365-2044.2009.06226.x] [PMID: 20105150] , 38Zhang JQ, Meng FM, Xue FS. Is dexmedetomidine or remifentanil alone an optimal sedation scheme for awake intubation? J Anesth 2013; 27(4): 627-8. [http://dx.doi.org/10.1007/s00540-013-1560-5] [PMID: 23377504] ]. In a systematic review, He et al. have shown that DEX reduces participants’ discomfort with no significant differences in airway obstruction, low oxygen levels or management of cardiovascular adverse events noted during AFOI compared with control groups [42He XY, Cao JP, He Q, Shi XY. Dexmedetomidine-midazolam versus sufentanil-midazolam for awake fiberoptic nasotracheal intubation: a randomized double-blind study. Chin Med J (Engl) 2015; 128(23): 3143-8.]. In a randomized double-blind study, the authors compare the effectiveness of sufentanil with midazolam and DEX with midazolam for conscious sedation for AFOI in combination with topical airway anesthesia with a “spray-as-you-go” method. In this study, the results were found to be comparable for the two groups in terms of patients’ tolerance and intubating conditions without affecting the patency of the upper airway. However, it has proved to be important to keep patients of sufentanil group responsive and compliant for the potential risk of respiratory depression [43Li CW, Li YD, Tian HT, Kong XG, Chen K. Dexmedetomidine-midazolam versus sufentanil-midazolam for awake fiberoptic nasotracheal intubation: a randomized double-blind study. Chin Med J (Engl) 2015; 128(23): 3143-8. [http://dx.doi.org/10.4103/0366-6999.170260] [PMID: 26612286] ]. Compared with placebo, in a multicenter study, Bergese et al. evaluated the safety and efficacy of DEX for Sedation During AFOI, showing that considerably less DEX patients than placebo patients needed midazolam to obtain and sustain the required sedation. The dose of midazolam required for sedation was significantly lower in the DEX group than in the placebo group, without compromising spontaneous ventilation [41Bergese SD, Candiotti KA, Bokesch PM, Zura A, Wisemandle W, Bekker AY. A Phase IIIb, randomized, double-blind, placebo-controlled, multicenter study evaluating the safety and efficacy of dexmedetomidine for sedation during awake fiberoptic intubation. Am J Ther 2010; 17(6): 586-95. [http://dx.doi.org/10.1097/MJT.0b013e3181d69072] [PMID: 20535016] ]. In 2013, double-blinded randomized controlled trial, Hu et al. compared the DEX with remifentanil for sedation during AFOI [40Hu R, Liu JX, Jiang H. Dexmedetomidine versus remifentanil sedation during awake fiberoptic nasotracheal intubation: a double-blinded randomized controlled trial. J Anesth 2013; 27(2): 211-7. [http://dx.doi.org/10.1007/s00540-012-1499-y] [PMID: 23073729] ]. This study described that both drugs were effective in patients undergoing AFOI. Although fibroscopy was more tolerated with DEX, there were no substantial differences in intubation scores in the two groups. However, DEX group showed better endoscopy score, lower recall of intubation, and greater patient satisfaction, with minor hemodynamic side effects. The analgesic effect of DEX plays an important role in improving patient comfort during AFOI, giving better intubation scores. Moreover, the antitussive effect of remifentanil minimizes the incidence of coughing during fibroscopy. This effect may be responsible for intubation scores comparable between the two groups, against higher endoscopy scores in the remifentanil group. DEX induces conscious sedation by activating the endogenous sleep-promoting pathway. Patients sedated with DEX are awakened more easily when stimulated than those sedated with midazolam; in addition, they experience little respiratory depression [39Bergese SD, Patrick Bender S, McSweeney TD, Fernandez S, Dzwonczyk R, Sage K. A comparative study of dexmedetomidine with midazolam and midazolam alone for sedation during elective awake fiberoptic intubation. J Clin Anesth 2010; 22(1): 35-40. [http://dx.doi.org/10.1016/j.jclinane.2009.02.016] [PMID: 20206849] -44Venn RM, Hell J, Grounds RM. Respiratory effects of dexmedetomidine in the surgical patient requiring intensive care. Crit Care 2000; 4(5): 302-8. [http://dx.doi.org/10.1186/cc712] [PMID: 11056756] ]. Furthermore, xerostomia described as an effect of DEX can provide a better field for fibroscopy by increasing visibility and reducing the risk of inhalation [45Aantaa R, Kanto J, Scheinin M, Kallio A, Scheinin H. Dexmedetomidine, an alpha 2-adrenoceptor agonist, reduces anesthetic requirements for patients undergoing minor gynecologic surgery. Anesthesiology 1990; 73(2): 230-5. [http://dx.doi.org/10.1097/00000542-199008000-00007] [PMID: 1974394] , 46Scher CS, Gitlin MC. Dexmedetomidine and low-dose ketamine provide adequate sedation for awake fibreoptic intubation. Can J Anaesth 2003; 50(6): 607-10. [http://dx.doi.org/10.1007/BF03018650] [PMID: 12826556] ]. The optimal dose of DEX required to achieve conscious sedation has been investigated in several trials [41Bergese SD, Candiotti KA, Bokesch PM, Zura A, Wisemandle W, Bekker AY. A Phase IIIb, randomized, double-blind, placebo-controlled, multicenter study evaluating the safety and efficacy of dexmedetomidine for sedation during awake fiberoptic intubation. Am J Ther 2010; 17(6): 586-95. [http://dx.doi.org/10.1097/MJT.0b013e3181d69072] [PMID: 20535016] ]. However, it has been shown that a loading dose of 1 mcg/kg followed by a 0.7 mcg/kg/h maintenance infusion of DEX is able to induce satisfactory sedation level in patients undergoing AFOI with or without low auxiliary doses of midazolam [47Chu K-S, Wang F-Y, Hsu H-T, Lu I-C, Wang H-M, Tsai C-J. The effectiveness of dexmedetomidine infusion for sedating oral cancer patients undergoing awake fibreoptic nasal intubation. Eur J Anaesthesiol 2010; 27(1): 36-40. [http://dx.doi.org/10.1097/EJA.0b013e32832e0d2b] [PMID: 19550337] ]. Dexmedetomidine for it sedative, anxiolytic, analgesic and sympatholytic properties may be considered as a useful drug during awake intubation, reducing participants’ discomfort, without depressing respiratory function and having a negligible impact on the cardiovascular system. The findings of this review should be corroborated by additional investigations. Additional investigations should corroborate the findings of this review. He X, Shi X, He Q. Dexmedetomidine for the management of fibreoptic intubation. Cochrane Libr 2012. Leslie D, Stacey M. Awake intubation. Continuing education in anaesthesia. Critical Care & Pain 2015; 15: 64-7. Afsani N. Clinical application of dexmedetomidine. S Afr J Anaesthesiol Analg 2010; 16: 50-6. He XY, Cao JP, He Q, Shi XY. Dexmedetomidine-midazolam versus sufentanil-midazolam for awake fiberoptic nasotracheal intubation: a randomized double-blind study. Chin Med J (Engl) 2015; 128(23): 3143-8.